The Mexican presidential election that took place on July 2 is over—but it is not done. Tens of thousands of Mexicans have been marching every week for almost a month in Mexico City and other cities throughout the country against what they call the “imposition” by Mexican election authorities of Enrique Peña Nieto of the Institutional Revolutionary Party (PRI) as president of Mexico. Inspired by the “I am #132” student movement and forming part of the newly organized National Front Against Imposition, on July 27 some ten thousand people initiated a 24-hour symbolic siege of the Mexico City broadcast center of Televisa, the institution they see as representing the economic elite’s control of the political process. Many spent the night in tents, some wearing the Guy Fawkes masks inspired by the film “V for Vendetta” that were so popular during in the Occupy movements encampments in the United States. At the same time, hackers supporting the movement succeeded in infiltrating the Televisa system and sending Televisa twitter messages against Peña Nieto. Meanwhile in the Federal Electoral Tribunal (TEPF) and in the Congress there are proposals to investigate election vote buying, to void the election because of fraud, and to install an interim president until a new election can be held. While initially it was students who protested against Peña Nieto, beginning before the election, since then they have been joined by Mexicans from all walks of life, among them school teachers, electrical workers, the urban poor and peasants. The students’ carnivalesque demonstrations have been completely different than the marches and rallies of political parties and labor unions that are usually carefully managed, highly disciplined and usually serious affairs. This is a youth movement, with all of its creativity and energy, and now with its older allies, attempting to stir the conscience of the nation, speaking out against a man and a party that its adherents see as representing everything that is wrong with Mexico, and seeing in this election an opportunity to change the course of the country. While they, like others, object to the alleged election fraud, they also object to what they see as an authoritarian party that will continue the neoliberal economic programs of the last 25 years. While it is also most a month since Mexican election authorities announced that Peña had received 38.21 percent of the votes, a plurality that should have made him the victor in the national elections held on July 2, still everything appears to remain up in the air. The election authorities have not yet certified the election and formally declared Peña Nieto to be president-elect. Opposition candidate Andrés Manuel López Obrador of the left-of-center Party of the Democratic Revolution (PRD), who came in second with 31.59 percent of the vote, alleges that there is enough evidence to show that the PRI spent more money than allowed, bought votes with gift cards, and in other ways committed fraud. He is demanding that the Federal Electoral Tribunal void the election and the Congress install an interim president until a new election can be held. There are no provisions in the Constitution for an interim president as the result of fraudulent election. The Permanent Commission of the Mexican Congress has discussed the possibility of a revision of the Constitution to create a mechanism by which Congress would choose an interim president, though some have suggested that the President of the Supreme Court would become interim president. The PRD and the conservative National Action Party (PAN, whose candidate Josefina Vásquez Mota won 25 percent of the vote, have called for Congressional investigations into the alleged vote buying. The PAN, however, is not seeking to overturn the election. 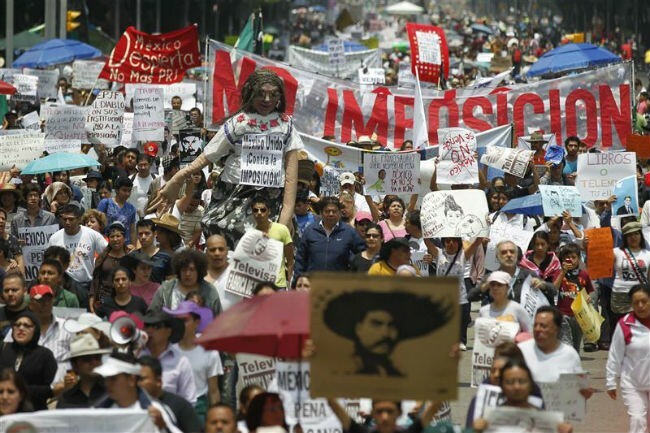 Meanwhile, tens of thousands of Mexicans, inspired by the “I am #132” student movement, have marched every Sunday since the election through the boulevards of Mexico City and the avenues of dozens of other cities throughout the country to oppose the “imposition” of Enrique Peña Nieto and the PRI on the Mexican people. The I am #132” student movement has been the leader of the mass movement which has grown up in opposition to the “imposition” of Peña Nieto. “I am #132” defines itself as an autonomous, peaceful, student social and political movement, completely independent of political parties, candidates and electoral organizations. The PRI claims that López Obrador controls or manipulates the movement, a charge that its leaders deny. Many of those active in the movement no doubt are supporters of López Obrador, but they do not carry his signs, wear his t-shirts, and hardly mention his name–the struggle they say is about democracy. Arguing that “we cannot do it alone,” the students brought together hundreds of popular organizations, including unions, community organizations, and peasant groups in a National Convention Against Imposition held in mid-July. The meeting was attended by 115 delegates from 17 states who came representing hundreds of organizations and gave birth to the National Front Against Imposition which organized the latest protest of ten thousand at Televisa. September 1 – A National Day of Struggle against the Imposition, including a march from the Federal Electoral Tribunal (TEPJF) to the House of Representatives to demonstrate against Felipe Calderón’s presentation of his Sixth State of the Union Address. September 6 – which is the day by which the TEPJF must certify the election – another National Day of Struggle to include the taking of public places, blocking of highways, the taking over of toll booths and opening of toll gates. October 2 – a national student strike accompanied by marches. Finally, a possible encirclement of the Congress to prevent Enrique Peña Nieto from taking office. This is, of course, a minority movement. Two-thirds of the country voted for the conservative National Action Party or the Institutional Revolutionary Party with its history of authoritarianism and corruption. While tens of thousands are marching, tens of millions either supported the Peña Nieto or accept the election results, even if they believe fraud may have been involved. The question is whether or the not students and their allies can stir the inert millions on the left, who tend to agree with them, into action. They only have a few months to do so, and they are fighting the government, the parties, and the media. *Please see the Manifesto of #YoSoy132 to the Peoples of Mexico on this site. Dan La Botz is a Cincinnati-based teacher, writer and activist. He is the editor of Mexican Labor News & Analysis. This article first appeared in New Politics.